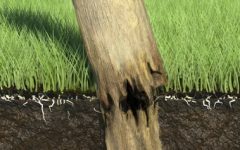 How can we install timber fence posts so as to have a long-lasting fence? It is a common misconception that if concrete is used to secure a post, than the concrete will prevent the post moving in the ground. Many customers are mistaken that concrete fixes anything and don’t really understand its role in securing posts. They do not understand that the ground itself moves, and that the concrete merely makes the base of the post larger and heavier. This weight and larger girth does make the post more secure but if there is either soft soil surrounding the concrete or continual pressure upon the post the whole concrete base will move over time. Such pressure is common in strained fences, like our poly fence, and is over come by bracing the post see horse fence post bracing. To install timber fence posts to prevent movement consider that the timber will shrink over time. Timber posts are often sold “green” or “wet” and will dry in the weeks after installation. When timber dries it reduces in size. However the concrete you set the post in will not change creating a space between the post and the concrete block. Over time the post will move within this space. This will happen with any formed of strained fence, the post will tend to lean in the direction of the strain. One tip to reduce any movement in concrete is to use some very large nails in the area of the post that will be covered in concrete. Simply lay the post down as shown on the picture below (left), and hammer in the nails around the post in the area to be set into the concrete. Please note many fencers prefer rammed in rock or sight soil at the immediate base of the post. It is not necessary to concrete to the full depth of the post, and in fact it is beneficial to use other materials also. This technique will prevent the post being pulled up when it contracts by the strained rail, horse impact or movement above. 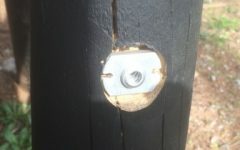 The post may be able to move laterally slightly, but it can never move far because the steel nails will not contract and will forever be in contact with the concrete. Installers of shade sails are often reluctant to use timber posts because of the contraction issue. Shade sales create a lot of upwards force on the post, literally pulling posts out of the ground. 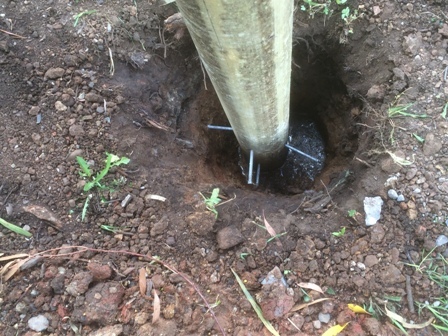 As such they often used steel posts, but this method is often used as well to accommodate timber posts. A similar force is created with our strained horse fence rail. For other general information on installing posts see our pdf manuals end post installations for horse fencing, and interim fence posts for horses.